This lesson will describe the Card script in detail and may be of interest if you are trying to learn revTalk. If you would just like to get your Video Player working as quickly as possible the you can skip this lesson and come back to it later. In this case you should have copied and pasted the entire Card Script that was provided in the previous lesson. In revTalk you can write commands that perform certain operations. We are going to write a command the populates the List Field with available videos. The definition for a command starts with the word command (1), followed by the name of the command (2). To finish the definition of the command you write end (3) followed by the name of the command (4). What Will The Command Do? Before writing the actual revTalk that populates the List Field I've added some comments that describe what I want to do. This can be helpful as the comments tell the story of what needs to happen. I can then go back and write the revTalk that actually performs the required actions. Here is what the command looks like when it is finished. The command calls a function call GetVideoFiles() (1) that returns all of the available video files, each one separated by the return character. We will look at what a function is in the next step. 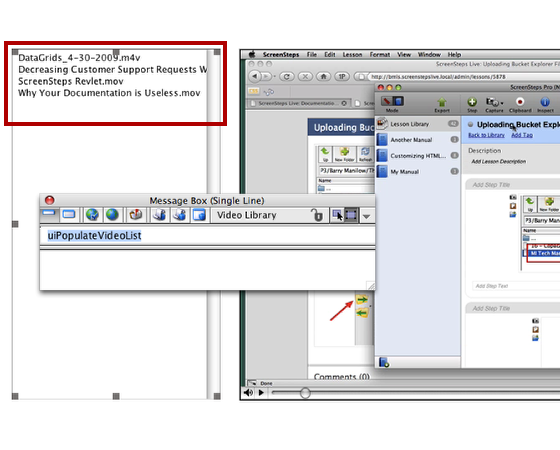 The command then assigns the list of video files to the text property of the Video Menu List Field (2). Assigning the text property of the List Field changes what you see in your Stack window. 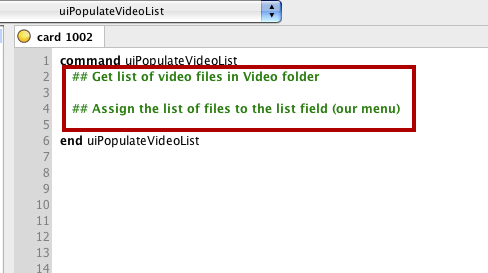 In the uiPopulateVideoList command we called a function that returns a list of video files. As of right now there is no function named GetVideoFiles that has been defined. Let's do that now. You define a function the same way that you do a command except that you use the word function rather than command. 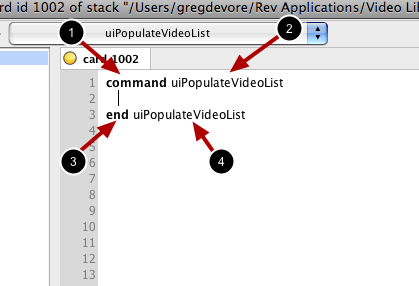 Notice how you can just add the definition of the GetVideoFiles function after the definition of the uiPopulateVideoList command. You can add any number of function and command definitions to a script. The purpose of GetVideoFiles is to return a return delimited list of all video files in the Videos folder that you created earlier. In order to do this we will need to get the path to the Videos folder on disk and then get a list of all the files in the folder. 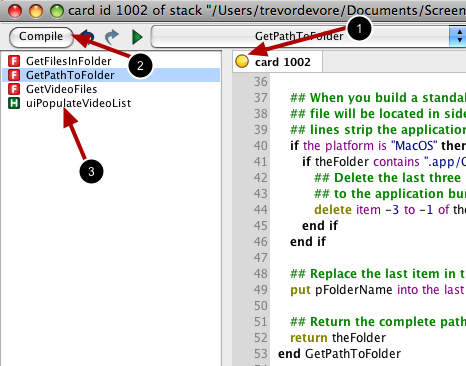 GetVideoFiles makes use of two other functions that help do this: GetPathToFolder and GetFilesInFolder. We will define this two folders next. When working with video the video files are stored separately from the application that we are creating. In this case the video files are stored in the Videos folder. When you share your application with others it is important that your application is able to find the video files on the computer it is running on. GetPathToFolder helps do this. 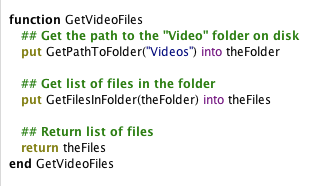 The purpose of the function is to take the name of a folder, in this case "Videos", and return the full file path to that folder. You can read the comments in the function if you want to learn what it is doing but for now you can just copy and paste it into your Card script and now worry about the details. The GetFilesInFolder function is a handy way of retrieving a return delimited list of files located in a particular folder on a computer. The parameter you pass in, pFolder (1), is the path to the folder whose files you want to retrieve. 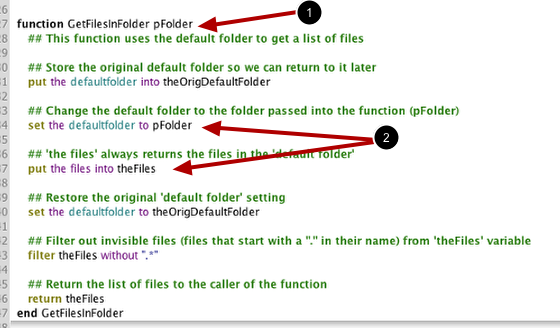 The function then uses the defaultFolder and the files (2) to get the list of files. Now that you have modified the revTalk in your Card script you need to compile the script. Whenever an object script has been modified the dot in the object tab will turn yellow (1). Click the Compile button (2) to compile the script. The dot will then turn green if the script compiled correctly or the Script Editor will alert you if there is something in your script that needs to be fixed, e.g. you typed something incorrectly. Also note that after you compile a script the list of commands and functions that you have defined in your script appear in the left column (3). This helps you quickly navigate to a particular handler (a handler is either a command or a function) in your script. We have now added all of the commands and functions to the card script that are necessary for uiPopulateVideoList to work. Let's test it out. Use the Window menu to select the Video Library Stack window and bring it to the front. Now we are going to use the Message Box to test the uiPopulateVideoFiles command. The Message Box is a tool that allows you to execute revTalk statements. Click on the Message Box button in the toolbar. The message box will appear and should look something like this. Make sure that single-line messages mode is active. 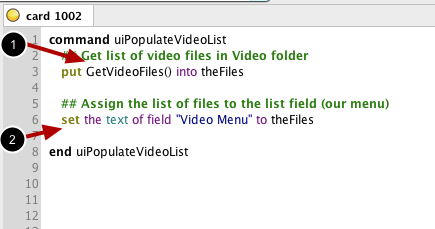 Type uiPopulateVideoList in top field and press the Return key (1). Because the Video Library stack (2) is the target of any commands executed in the Message Box the uiPopulateVideoList command you defined in your card script will be executed. 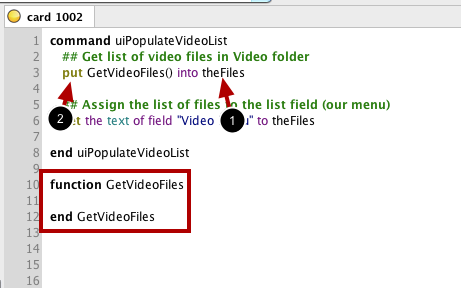 After pressing the Return key the List Field should populate with the videos in your Videos folder. your application is missing the player "My Video". Similar to when you created the field "Video Menu", just drag the "QuickTime Player" on to your card and give it the name "My Video"